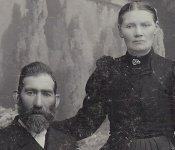 This page is a portal to the Ray/Endreson/Leraas/Lohse Interactive Family Tree (family.mnray.net) to simplify finding information about persons of interest. If you are already familiar with the system, you can use the link above or the picture to the right to get to the main page. For some individuals, we do not have any pictures, but we do have documents such as Naturalization and Immigration Records. If you are interested in any of these families, choose a person from the table below to be taken directly to his or her page. All links below are to deceased ancestors because information about living people is only available to family members with an account & password. If you do not log in, such information is listed as "Private." See below for more information about navigating the Family Tree site, including how to request an account. Who would have thought that so many people would be descended from such a small and remote farm near Bergen, Norway? Oral tradition tells of an Olav Johanneson who was denied inheriting farmland at Myster. He climbed up to Leiro with only an ax on his shoulder to carve out a new life. The records of the Leiro Gaard generally agree with this story. The first recorded tenant at the farm was this pioneer's son, Johannes Olson Leraae, who was 31 in 1664. Several descendants have made the journey to the former Leiro farm, only accessible via a two hour hike up a winding mountain trail. All who visit are beholden by the area's beauty, nestled between two waterfalls. Johannes Olsen Leraas (1804 - 1880) was the patriarch of a vast family from three wives. 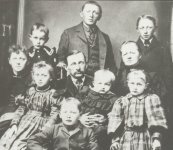 Like many Norwegians of the time, most of his children emigrated to the Midwest in the United States. The family moved to Oregon where Mons died. If you want to include living people in your search, then you must first use the "Login" link shown in the picture below. If you don't like the Background Color or icon set, feel free to "Change Theme" from the drop-down menu. It is also possible to choose a different language by clicking on a flag. Requesting an account is easy. After the "Login" link, click on "Request new user account" and fill in the requested information. Your email is only required for administrative purposes and will not be shared. From the home page of an individual, use the "Chart"pull-down menu to create one of a variety of types of charts such as "Ancestry", "Descendency" or "Hourglass" From the Chart boxes, remember that clicking on the person's picture will only bring up that particular picture. Click on the person's name to get to his or her home page. The magnifying glass button brings up details about the individual. 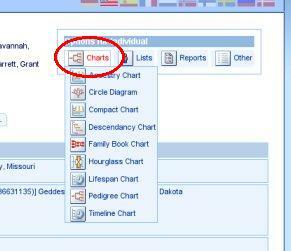 The chart button can be used to create a new chart based on the new subject. The majority of the Family Tree was compiled by Diane (Heuchert) Berg. She created GEDCOMs about the Ray and Bridges families, which were combined into this database. 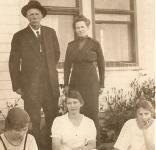 She continues to publish a newsletter about Ray family history. 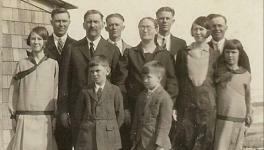 The information about the descendants and in-laws of John M. LeRoss, (who changed his name from Leraas) was contributed from a GEDCOM by Les LeRoss. 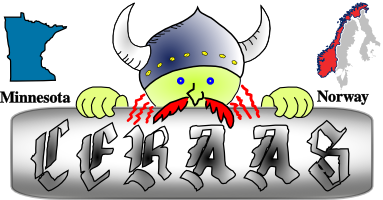 Eric Ray entered most of the Leraas, Eide, Golz, and Lade information into a GEDCOM file based on information from several family histories.The sources are cited in the Family Tree. His parents, Steve & Linda, also performed a considerable amount of research. We need fact-checkers! Please let us know if you find mistakes. Please submit a flattering portrait of yourself and each of your ancestors. Remember that only family members with an account will be able to view photos of living individuals (like yourself!). 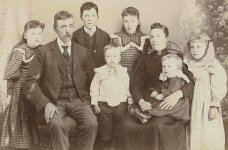 Help us fill in the blanks with information about your immediate family. If you ended up with Family Bibles, old Photographs, or important Documents, please let us know. Better yet, scan them into the computer so we can share them with everybody. We can't travel everywhere. If you are traveling or happen to live near an area mentioned in the Family Tree, please consider visiting the government offices or churches to photocopy records. The next phase involves posting pictures of gravestones. If you are near an appropriate cemetery, please take some pictures and email them to us. Sometimes important facts are lying right out in the open!